For those of you who know me, I am not much of an outdoor girl. 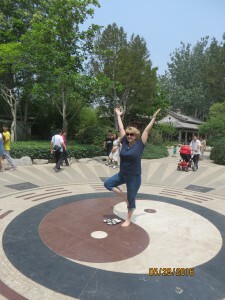 The trip to China has challenged me in many ways. 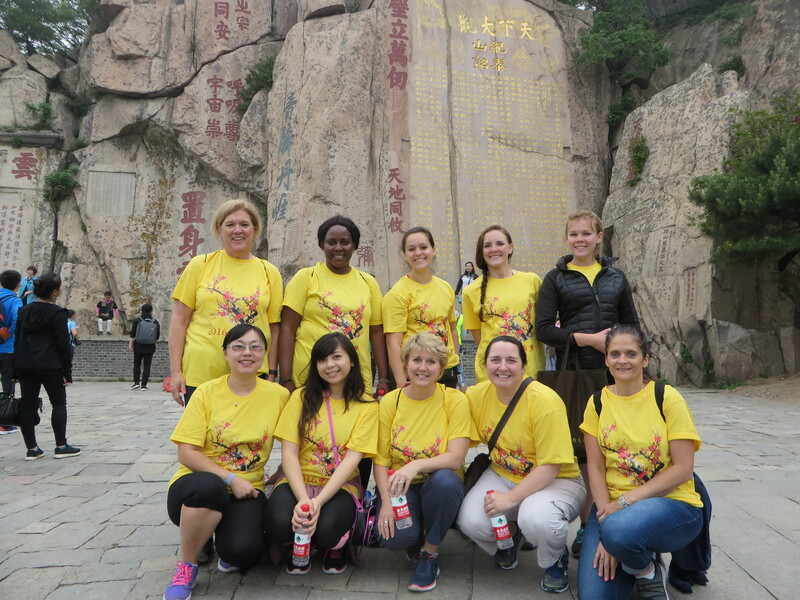 I climbed part of the Great Wall of China last week and this past weekend the nurses from UMass Lowell “climbed” one of the most famous mountains in China, The Tai Mountain. I use the word “climb” with some hesitation. On the advice of our wonderful guide Tony we decided to do a smaller initial climb and then opt to use the gondola to get us close the peak. We still had a fair amount of climbing after the gondola. As the weather changed it appeared that we were climbing into the sky. 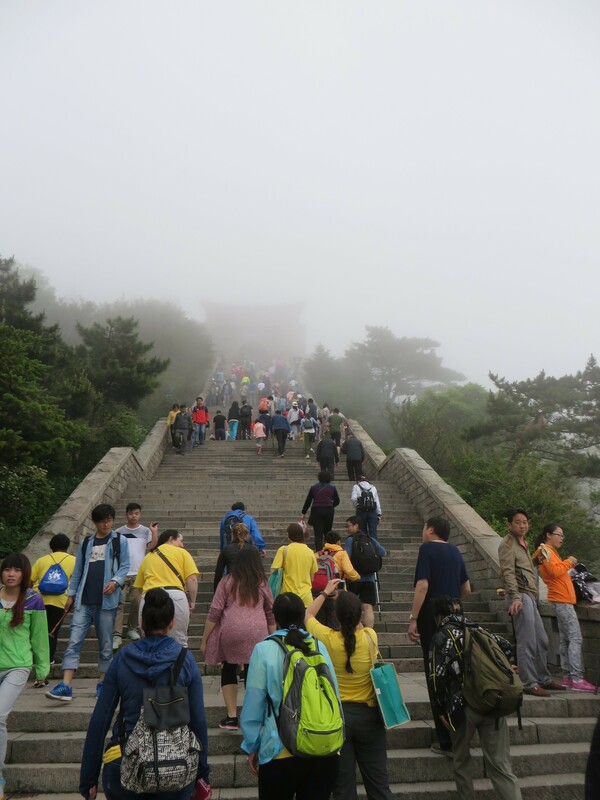 We made it safely to the peak for a round of photos ( along with hundreds of fellow Chinese climbers). 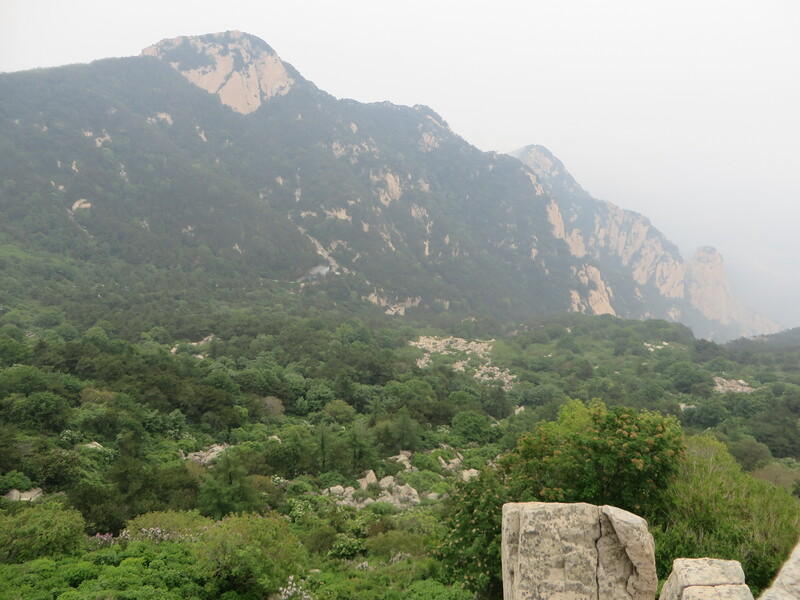 This mountain is very significant in Chinese history. 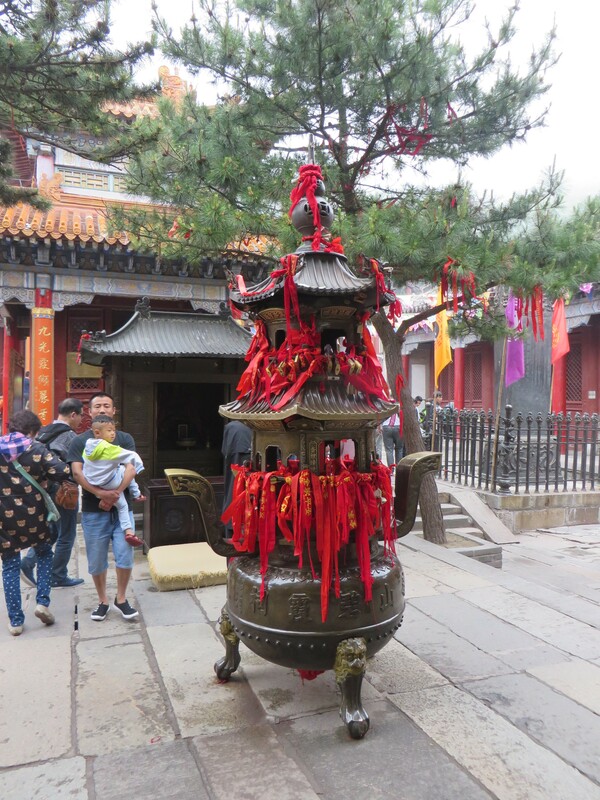 The recorded history goes back about 3,000 years and it has been an important pilgrimage destination for emperors to worship the gods. 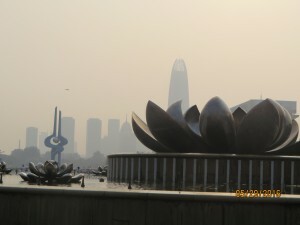 It is a UNESCO /World Heritage Center . 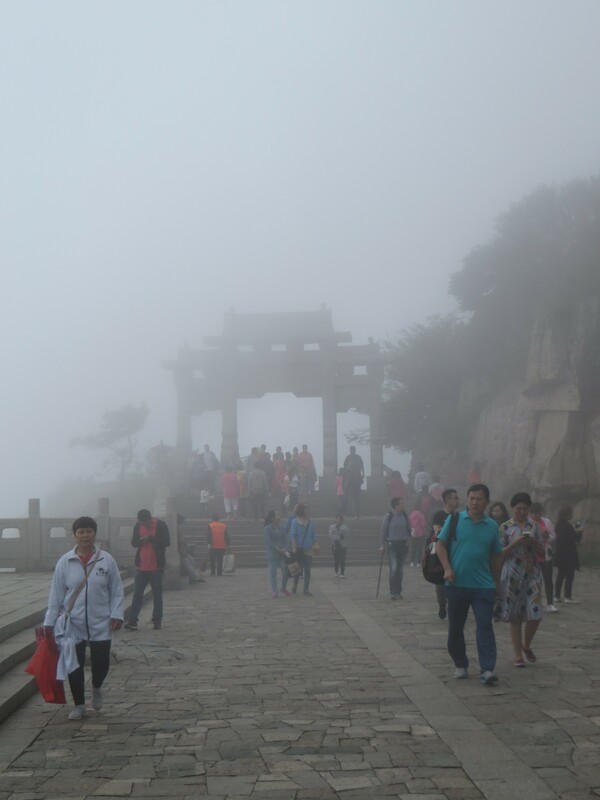 On the mountain there are 12 historically recorded imperial ceremonies in homage to Heaven and Earth, about 1,800 stone tablets and inscriptions, and 22 temples . In my comfort zone ! Today we are in my comfort zone. We went to visit a community health center. It is one of 8 centers that are affiliated with a hospital. The woman in the turquoise jacket is the nurse who is the director of this location as well as the overall director of the other centers. She was warm and welcoming and quite curious as to the status of our community health centers and home care in the US. This is where I have the most interest and experience. I found that although the location looked different from home there were many similarities. 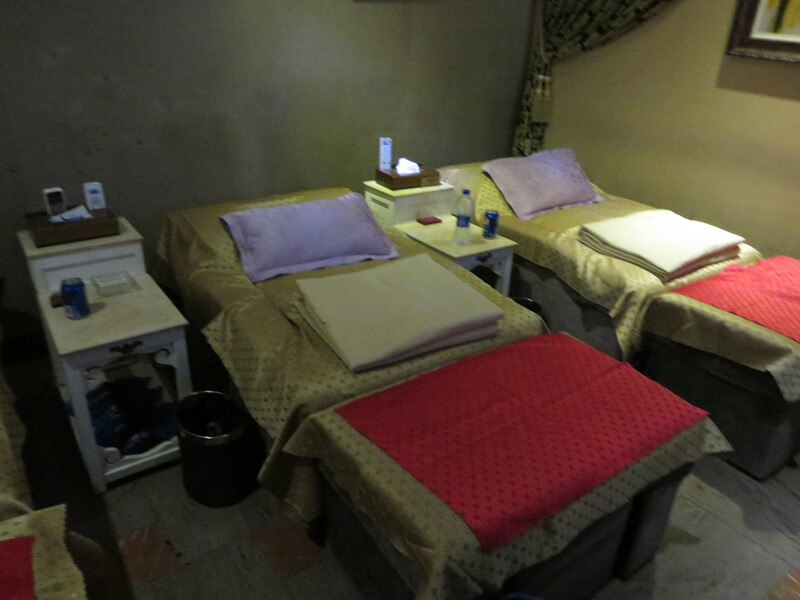 They provide very holistic and comprehensive care to the people of their community. 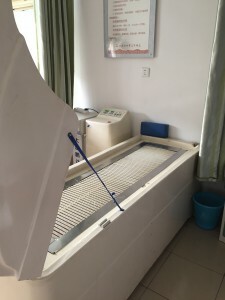 There are multiple aspects of care that is provided from prenatal care to well child care, elder care on site and also home visits, post-partum care home visits, rehab services, lab and EKG, and of course a multitude of traditional Chinese therapies that we have seen in most of our visits. 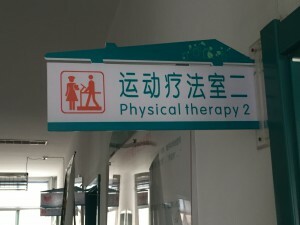 The nurses and doctors were overwhelmingly friendly to us despite our inability to communicate unless with interpreters. Every UML nurse was allowed to go and observe a home visit with a doctor. That was interesting to me in that the doctors performed a significant number of home visits. It was noted by all the UML nurses that the assessments and interventions performed by the doctors are all within the the realm of nursing in the US and that we were surprised that a nurse was not doing that postpartum check or the evaluation of the elderly patient with hypertension. Maybe it was that the doctor wanted to do the visit with us or maybe it was the standard of care for these patients to receive their care from a physician for these type of visits. There was much interest in the number of visits made to the home by either the nurse or doctor. We have been told it can be up to 14-15 visits per day but many of those visits are for quick immunizations. Speaking of immunizations they proudly report about a 100% vaccination rate for their pediatric population and were quite surprise that we were impressed with that number. We didn’t get into the whole controversy over vaccines in the US but we did state that some parents refuse vaccinations. All vaccines that are made in this country are free to patients but any vaccine made out of the country there is a small cost. 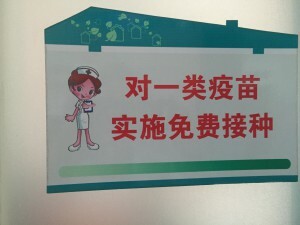 Another interesting recent development in China ( effective June 1) is that the health care facilities have to provide medication at zero profit. Which means that if they purchase or acquire the drug at a certain cost then they cannot upcharge the fee to the patient. 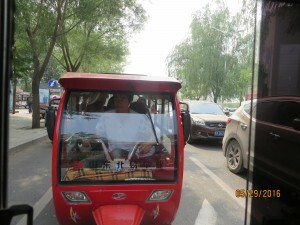 This is a new regulation in the city of Jinan ( all the health care facilities). We believe it is a pilot regulation and will be implemented in the future in the province of Shandong and possibly country wide. Now wouldn’t that be an interesting tactic to address the cost of medicine in the US ( we would have to get the pharmaceutical companies to be realistic with their costs as well). So much to write about but I will end my blog with my delight in observing the community health center/home care and realizing that in the US we have similar centers and type of care. 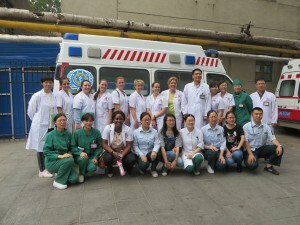 We were so happy to be able to share with our Chinese counterparts about community based care in the US. Fumigation chamber. The patient lies in this chamber. Herbs are botanicals are put under the grate in a warm steam bath and the patient is exposed to the “fumes” to help treat musculoskeletal issues. 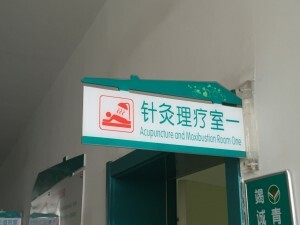 Moxibustion: A small cone of dried herbs is slowly burning on a patient’s back. It has been a very busy two days. On Monday we started the academic portion of our trip. We began the morning with a welcome meeting between the students and faculty of UMass Lowell and the leadership of Shandong University. 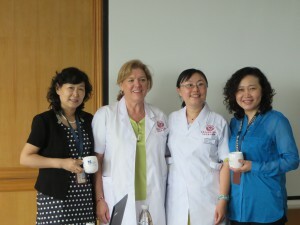 We viewed a wonderful presentation about the university ( albeit in Chinese) and were very warmly welcomed by the nursing and academic leaders of the university. Everyone is so friendly and excited to become better aquainted. 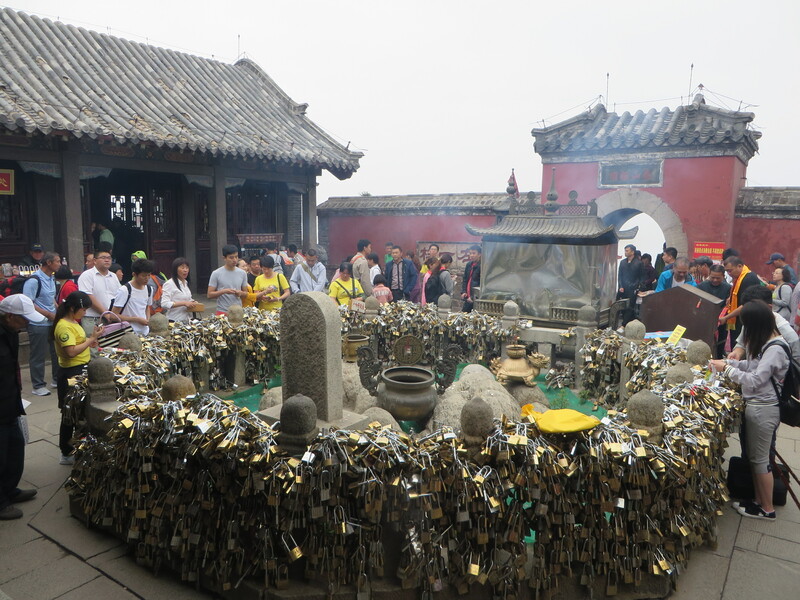 There have been a few other academic collaborations with Shandong University ( UPenn, Ohio State) but I believe that we may be the largest contingent that they have hosted. Some of the other collaborations with schools of nursing have been with smaller groups and sometimes 1-3 students who are studying at doctoral level. Our group is very unique in that we represent all levels of education at UMass Lowell. We have recent BS grads, RN-BS grads and students, MS students and one PhD student. 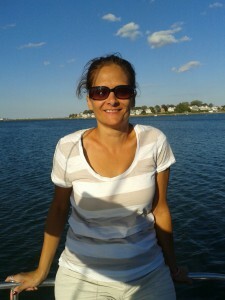 Yuan is a UMass Lowell educated PhD and I am a DNP. We represent the whole spectrum of educational paths at UMass. 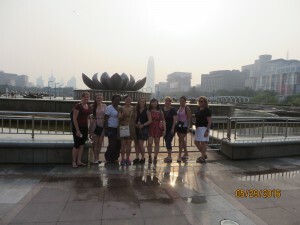 I believe that our group has a lot to offer our host school in terms of our professional experience. We represent many areas of practice from outpatient advanced practice to inpatient acute care, ER, outpatient pediatrics, insurance management, veteran’s care and academia. Our host country has planned an ambitious schedule of events and so far we have been amazed at their organization and ability to allow us to see specific units of their hospital. Briefly.. the Shandong Hospital system is a large multi-building complex with over 4000 beds! Compare that to Lahey Clinic which has 400 beds. The sheer size and logistics of staffing and running this medical entity is a feat in itself but this hospital has garnered many awards for procedures and quality and is a one of the top rated hospitals in the country. We are honored to be able to observe their health care system. We have been allowed to visit and observe units that normally are not open to visitors. It amazes but us that we have been permitted to view these areas. And they are all impressive in many ways. I am not going to write about specific experiences today in my blog but will ask the students to write a bit about the experiences. 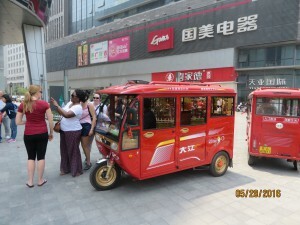 I will enclose a few photos taken in the last few days with our new Chinese friends and colleagues. 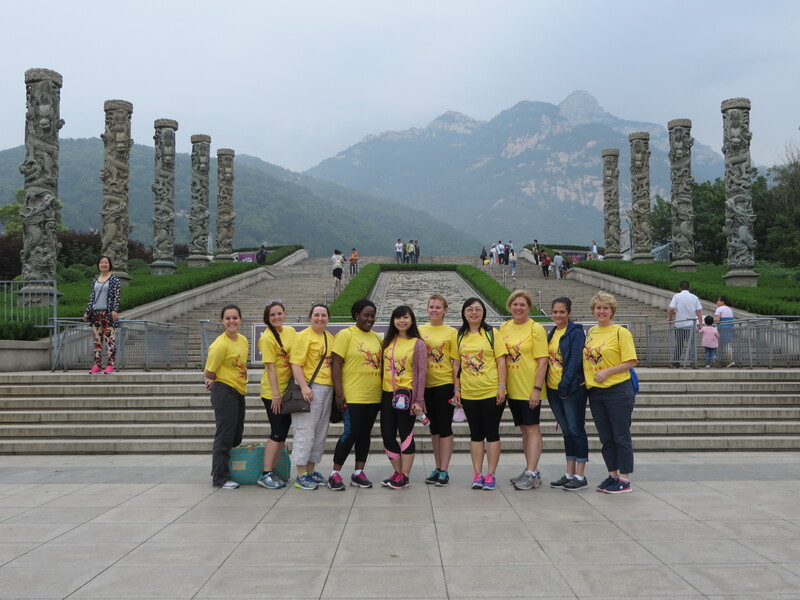 I am not sure if our Chinese friends will read this blog but I want to publicly thank the Shandong School of Nursing and the Shandong Hospital for their hospitality. When all is said and done at the end of the day we all share the same heart, the same motivation and that is to provide excellent care to our patients and improve the health of our nation. 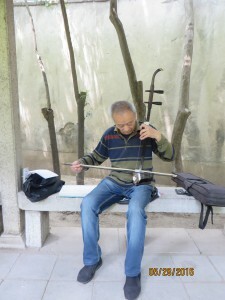 A Chinese man playing a traditional Chinese stringed instrument at the park today. What a great post from Kristen regarding our day. She captured the essence of our day. 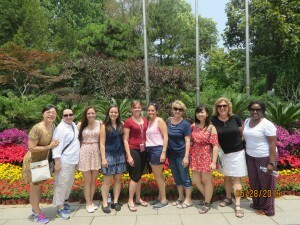 What a joy to travel with such a wonderful group of women. I am just going to attach some photos from today for your viewing. My fellow travelers are going to do a BLOG entry about some of our adventures today. For those of you who have read my UML BLOGs before I like to write about my observations. 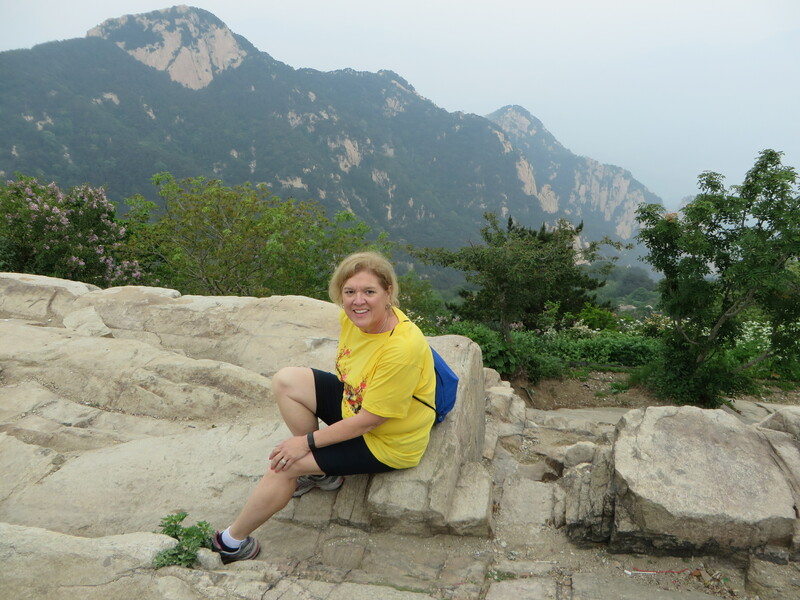 Well, this morning I got up early and went for a walk ( totally forgetting that I was scheduled to climb the Great Wall of China later today.. Needless to say my Fitbit recorded lots of steps). 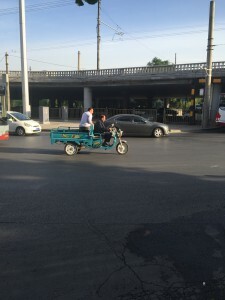 What I wanted to share with you all today was my early observations about transportation in and around the city. I am fascinated to explore the patterns of society in new places for me. Today was no exception. 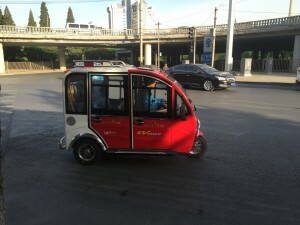 Beijing at first glance could be like any other big US city. Filled with skyscrapers, paved roads, bridges, cars, buses and people all moving to make it to home or work. The mode of transportation just looks a bit different in some cases. Yes, they have the assortment of shiny new cars like Kia, Toyota, Hyndai and an occasional American car but it is the movement of the non-car people that have me mesmerized this morning. 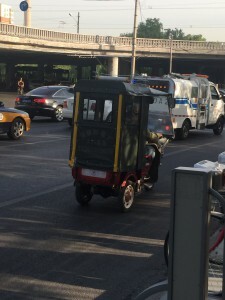 I am told that there is a lottery for license plates in China due to the overcrowding of the streets so that even if you can afford a car you might not be able to register it and drive it unless you have a license plate. So many people resort to other “wheels” to get around. I saw so many different vehicles and regular people just trying to get to work. 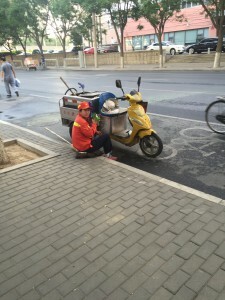 A sanitation worker near her small scooter wearing her face mask to protect her against the air pollution and sun. 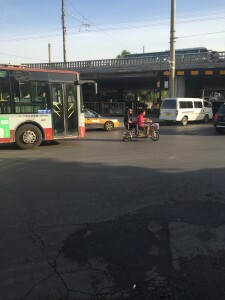 Mother’s riding motorized scooters with their child eating breakfast on the back of the scooter ( no helmet), peddle bikes with 2 or more people riding to work, small “toy” vans barely big enough for a driver but a passenger in the back. 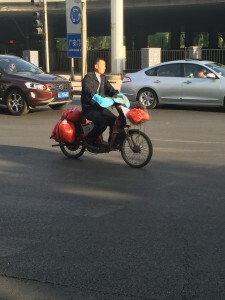 A man on a motorized bike with his wife in the back, another man in a motorized scooter with 2 other workers in heading to work. 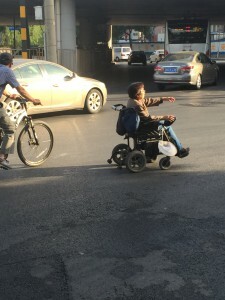 I even saw a women in a motorized wheelchair playing “chicken” with big buses and cars in a busy rotary. Many of the motorcycle drivers wear mitts on their hands that look like oven mitts. They are for warmth in the winter and in the summer they protect the hands from sun. Interesting that they are worried about sun damage but not worried about head injuries. All of the people appear fit with very little obesity noted. This must be attributed to their diet and exercise. It makes we wonder if the US developed a restrictive rule with our access to license plates then maybe we could see better health and less obesity. Hi Everyone. 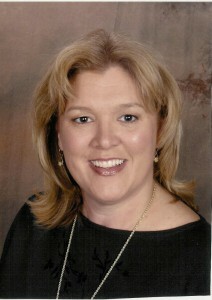 My name is Barbara Smith and I work as a nurse in a small community hospital. When I enrolled in the RN-BS program I never thought I would be given such a wonderful opportunity to travel to another country. Throughout my career I have learned many new things, met and taken care of many people from different cultures and backgrounds. 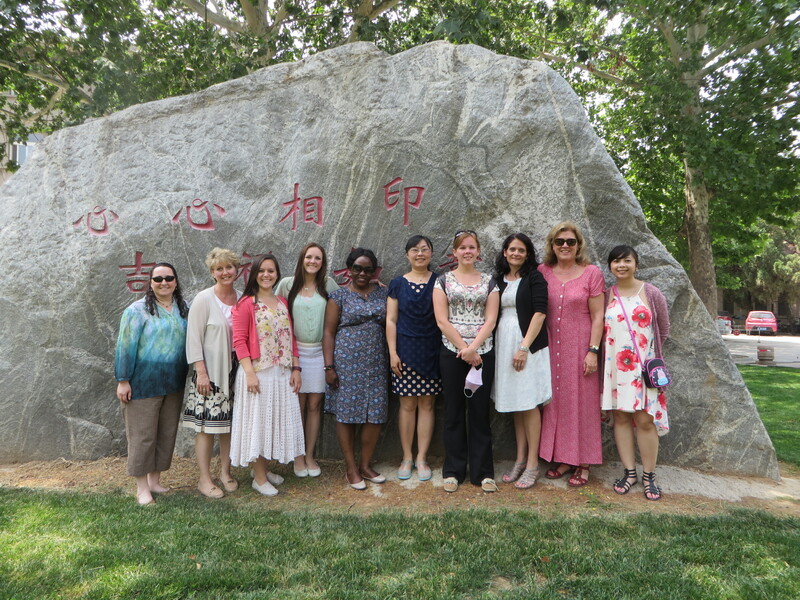 I consider myself lucky to be part of a this group of students and professors travelling to China. I have never travelled outside the US so this will be the first time for me. As you can see, I am thrilled to be part of this trip and look forward to embracing all that China has to offer. Not only will I have the opportunity to grow as a nurse, I will experience China’s culture and beauty as well as health care system. I am extremely excited to visit acute care facilities and universities to compare our system versus China’s. I’m excited to share our photos and experiences we are about to embark upon. To my co-student and professors…we will see each other soon. Hi Everyone! 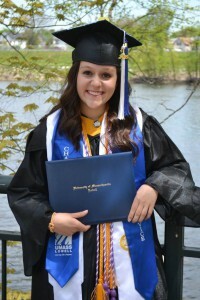 My name is Nicole Hamel and I just graduated with my B.S. from the Nursing program. It is crazy to think that the start to our trip is just two days away! There is still so much to do before we embark, including packing, which knowing me I will do Monday night before we leave. Even though I just graduated, I am what you would call an experienced world traveler. I have been to probably 15 plus countries in my lifetime; it’s hard to keep track of them all. I truly have wanderlust. Before deciding to go to school for nursing, I traveled the world for a year doing community service and performing with a group called Up with People. My travels did take me to Asia, The Philippines to be exact, but I have only ever had a layover in China for a mere 45 minutes. So as you can tell I am extremely excited to go back to Asia and finally experience China and its culture. 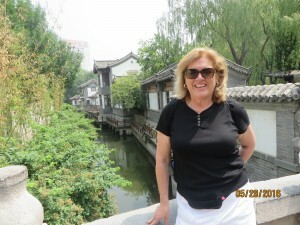 I am someone who enjoys culture and learning about the different ways people live their lives. 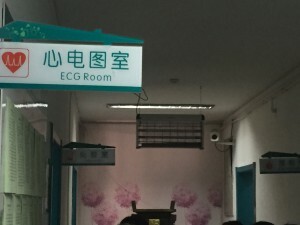 What excites me most about this trip is the fact that not only do I get to learn about Chinese culture, but I get to learn about Chinese healthcare. We have always been taught in school “You must always be mindful of cultural differences.” The problem is even though we are taught about them, we never truly understand them because unless we have had a patient experience, we never see the differences. This trip is exactly that. It is allowing each and everyone of us to experience the differences. It is going to allow us all to become more culturally aware and it is going to make us better nurses in the long run. I am always looking for new ways to expand my knowledge and become more of a global citizen and the only way to truly do that is to visit other countries and spend time in their communities. From looking at the itinerary, this is going to be a jam packed trip. I will be experiencing China, celebrating my 23rd birthday, and also studying to take my NCLEX. I have a plan to do 100+ questions a day while I am there on top of everything else we will be doing. But I am READY. Two more days! 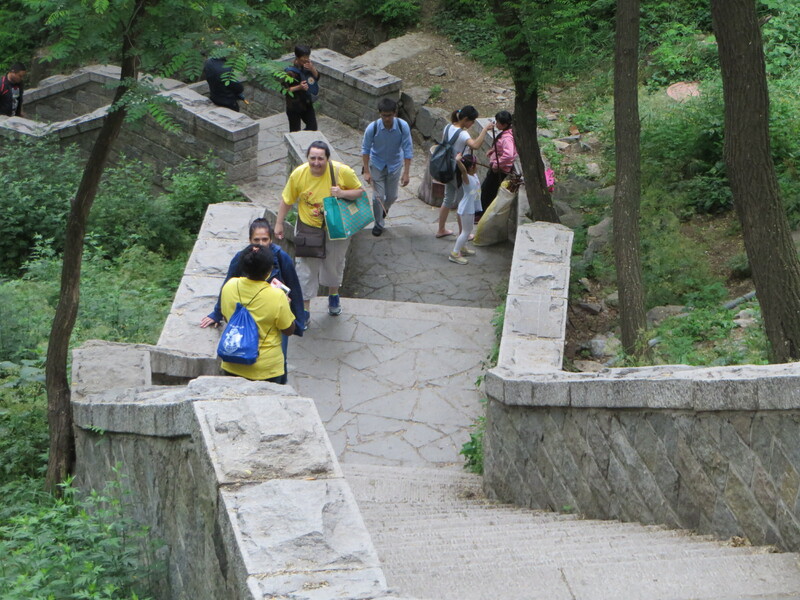 The Spring semester is over but the summer semester, Global Health Experience, is about to begin. 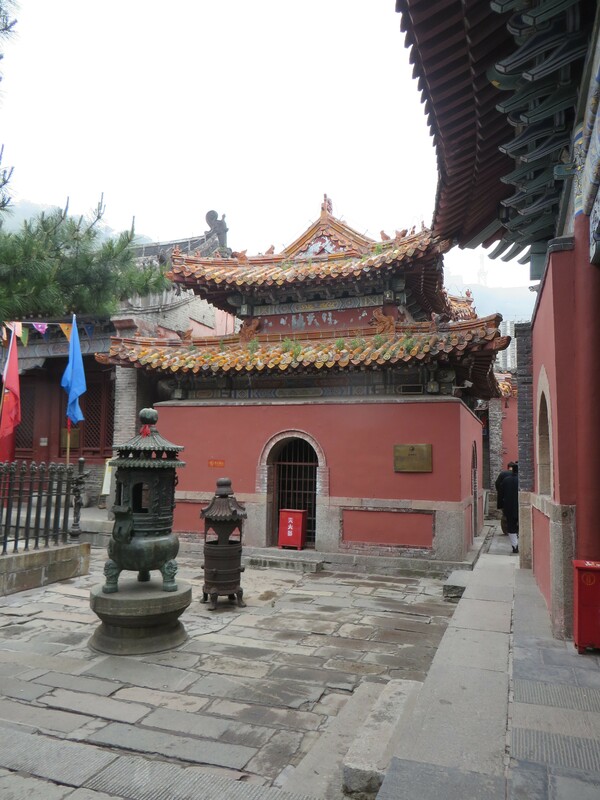 Our journey starts on May 24, 2016 with an early flight to Toronto and then on to Beijing. We arrive in Beijing the next afternoon around 4 pm. 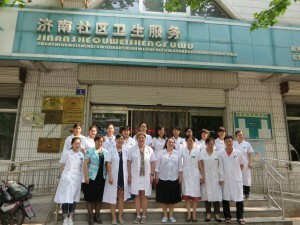 The coordinators of the trip, myself, Valerie King and Yuan Zhang are faculty in the School of Nursing at UMass Lowell. 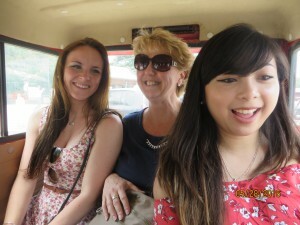 This is my 5th trip taking students on international experiences ( Ghana 2009-2011) and Chile (2013). 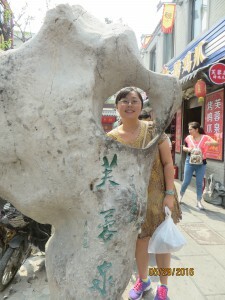 This is Yuan’s first trip with students but she is from China and will serve as our ambassador for this trip. Please follow along with us and check back often at this BLOG site for some stories and photos. It will be a fascinating trip and we will have many stories to share.